There's reading good books, and there's listening to good books, and the two are very different. I love the physical act of reading, my eyes following the words on the page, turning each page as I finish, closing the book with a snap after finishing a chapter. But I also love listening to a book--not on tape, but on CD. (Too much effort to rewind, and the tapes take up too much space, unlike that slim, nifty CD.) My listening standards are lower than my reading standards, probably because I'm always driving while listening to a book, so all the story has to do is distract me from dreary driving, but not so much as to cause me to utterly forget that I'm moving at 60 miles per hour in a heaving hunk of steel. 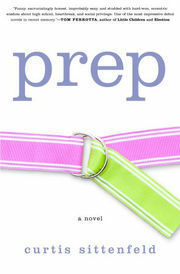 Right now, I'm listing to Prep, by Curtis Sittenfeld, a book that follows Lee Fiora, 15, through her four years at a snooty, New England prep school called Ault. The writing is superb--it captures exactly the painful, shame-filled, excruciating self-consciousness and awkwardness of a teenage girl. We hear about Lee's endless ruminations on how she thinks other people see her, how she sees herself, how she wishes other people saw her, and endless variations on the theme of Me, Me, Me. Her anxiety and obsessing and envy and ignorance are grating and irritating and exactly right. Plus, the woman who reads the book has absolutely the voice of a teenage girl--I feel as if I'm listening to an actual Lee recite her own story. (I'm fairly gullible that way.) This book is relatively old, published in 2005, but it's new to me, and I'd recommend it to anyone who feels brave enough to get deep inside the psyche of an insecure but insightful teenage girl. It's really painful! 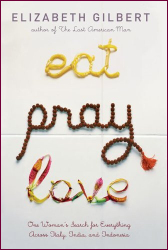 Another book that was incredibly great to listen to: Eat, Pray, Love, by Elizabeth Gilbert. She reads her own story, about her year-long trip to Italy (eat), India (pray), and Indonesia (love), and it's a beautifully- written hilarious and poignant account of a 30-something woman finding her way, alone, in the world. You should not listen to this while driving, however, if you are embarrassed that another driver might see you laughing or talking to yourself. You won't be able to stop yourself if you listen to this in the car, so beware. After listening to Gilbert read this book, I was really tempted to write her a fan email. So, I did, I'm embarrassed to say. This was right after the book was published, in February of 2006, and it hadn't hit the best-seller list yet, so I guess she was still flattered to get some flattery. At least I think I emailed her--if I didn't, I really wanted to, so it seems as if I actually did... See, as a Boomer, I have so many memories and anecdotes and pieces of information stored in my brain, that I am no longer sure what is a real memory, and what is Memorex: my own imaginary memory. In this case, unlike, say, if I'd been a witness in a murder trial, it doesn't really matter.